4-SLICE TOAST CAPACITY Now you can make enough toast for the whole family û all at the same time. 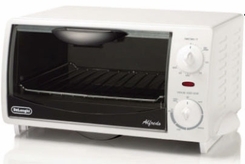 BAKE, BROIL, TOAST, OR KEEP FOODS WARM The Alfredo is the ideal multi-function family oven. And multiple cooking settings with adjustable temperature control let you prepare food simply and conveniently. TOAST COLOR SELECTOR Toast color selector and end-of-cycle signal with auto shut-off assure perfectly prepared toast every time. DROP DOWN CRUMB TRAY Easy removal makes cleanup quick and effortless. ACCESSORIES INCLUDED Aluminum bake pan. SLEEK, ATTRACTIVE DESIGN Complements any kitchen decor. Internal Capacity: 0.35 cub. ft.